Greece located in the southern part of the European continent and belongs tot he Balkan Peninsula.The Greek Climate .Greece belongs to the Mediterranean European countries and because of this it has a Mediterranean climate with mild winters and dry summers. However, the climate in Greece varies from region to region. For example, the islands have smaller differences of temperature during the day than the mainland. Western Greece has more rain than the eastern part. Northern Greece has a colder climate than the rest of the country. The Ionian islands and southern Crete have the best climates with very small differences between winter and summer temperatures. The Aegean islands have less rainfall and they experience strong winds in summertime known as the Meltamia. 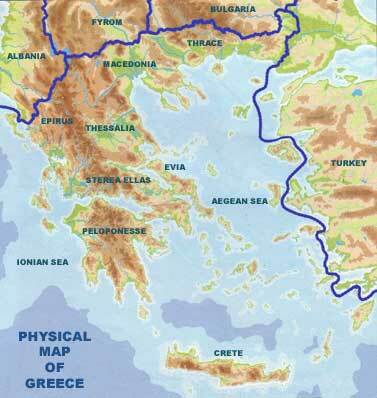 Regions of Greece: Greece is divided into 13 geographical regions and each region is divided into prefectures. The region of east Macedonia and Thrace have the prefectures of Evros, Xanthi, Rodopi, Drama and Kavala. In the region of central Macedonia are the prefectures of Serres, Thessaloniki, Halkidiki, Kilkis, Pella, Imathia and Pieria. In the west Macedonia region are the prefectures of Kozani, Kastoria, Florina, and Grevenon. In the region of Epirus are the prefectures of Arta, Ioanina, Thessprotia and Preveza. In the region of the Ionian islands are the prefectures of Corfu, Zakynthos, Kefalonia and Lefkada. In the region of western Greece are the prefectures of Aetoloakarnania, Achaia and Ilia. In the regions of Pelopenesse are prefectures of Corinthia (Corinth), Messinia, Arkadia, Lakonia and Argolida. In the region of Thessalia are the prefectures of Larissa, Trikalon, Karditsa and Magnesia. In the region of Sterea Ellas are the prefectures of Fokida, Fthiotida, Evrytania, Viotia and Evia. In the region of Attica is the prefecture of Attica where the capital of Greece, Athens, is located. In the region of the north Aegean are the prefectures of Lesbos, Samos and Chios. In the region of the south Aegean are the prefectures of the Dodecanese and the Cyclades. And finally, in the region of Crete are the prefectures of Heraclion, Chania, Lasithi and Rethymno. The Greek seas: The Aegean Sea is actually divided into three parts, north central and south. In the old days the Greek seamen gave the different parts of the Aegean sea different names. the area around the north Aegean Islands was known as the Thrakiko Pelagos. the area between the Cyclades and the Dodecanese was known as Ikario Pelagos. the seas south of the Saronic Islands down to the S.E. Cyclades Islands was called Myrtoon Pelagos. The sea north of Crete was known as the Cretan Pelagos (Kritiko). Finally, the sea between the S.E.Cyclades Islands, Rhodes and Karpathos was called Karpathion. The Ionian Sea stretches between the west coast of Greece and the coast of Southern Italy. The Ionian sea has some of the deepest waters of the Mediterranean and in some parts can reach a depth of 5,000 metres. The seas around Greece cut in and out of the shoreline creating an interesting lacework coastline with many large and small peninsulas, gulfs and caves. Because of this geographical morphology Greece has the longest coastline in the Mediterranean. From antiquity to the present day the sea has played an important role in the life of the Greek people. As an island nation the only chance they had for developing both politically, culturally and economically was to expand and become proficient at seafaring in order to communicate, both with each other and with other nations. Still today, the Greek fleet is one of the largest in the world. Thus, once could argue that the sea has been paramount to the development of both modern and ancient Greece. The mountains of Greece are a continuation of the mountain range of the Balkans, with in turn are a continuation of the Alpine range. The two greatest ranges in Greece are the Pindos and the Rodopi. Most of the biggest rivers of Greece have their springs on the mountain range of Pindos. Among them, the rivers Aliakmon, Pinios, Acheloos, Kalamas and Arahthos rivers. The rivers of Evros and Nestos have their sources in Bulgaria. In the Peloponese are the rivers of Alfios and Eurotas with their sources in the Taygetos Mountains. The largest valley of Greece lies between the east slopes of Vermion mount the south slopes Paikon mount and west of Thessaloniki facing to the south the Aegean sea with the cultivation of cotton ,tobacco ,wheat ,peaches ech. The next largest is the Valley of Thessaly (Kampos Thessalias) . InTthessaly Valley, at the village of Kileler, was the first agricultural revolution in Greece in .1910. There are smaller valleys in many regions of Greece where the main fruit production of Greece is cultivated. This is especially so in the valleys of Crete the garden of Greece with the biggest production in oranges ,tomatoes ,olives and olive oil ,cucumbers and many other kind of fruits and vegetables .In North Peloponese valleys on the northern slops of Helmos and Kylini mountains with cultivation of sultana grapes in Corinthia, lemons and grapes in Achaia.